The Barrage is the first to feature the AXIS Assist. They offer quick, one-handed opening and can be operated equally with either hand. Intended for Everyday use, our Barrage family has a standard clip type with a reversible tip-up clip position. The Mini Barrage 585 has a lanyard hole. Specifications: Designer: Osborne | Mechanism: AXIS-Assist | Action: Assisted-opening | Blade Steel: 154CM (58-61 HRC) | Blade Length: 2.91" (7.39cm) | Blade Thickness: 0.100" (2.54mm) | Open Length: 6.91" (17.55cm) | Closed Length: 4.00" (10.16cm) | Handle Thickness: 0.57" (14.48mm) | Weight: 3.40oz. (109.71g). WELL-DESIGNED: The Barrage family is the first to feature the AXIS Assist. The Mini Barrage 585 can be opened and closed quickly and single-handedly. It's also fully ambidextrous. COMFORTABLE: The 585's smaller, lighter design and quick opening make it comfortable to hold and easy to use. The reversible pocket clip offers ultimate accessibility. VERSATILE: The Mini Barrage 585's drop-point, utility blade style and all-around functionality make it ideal for everyday carry and outdoor activities. GUARANTEED FOR LIFE: Benchmade's limited Lifetime Warranty and LifeSharp Service keeps your knife in the best condition. 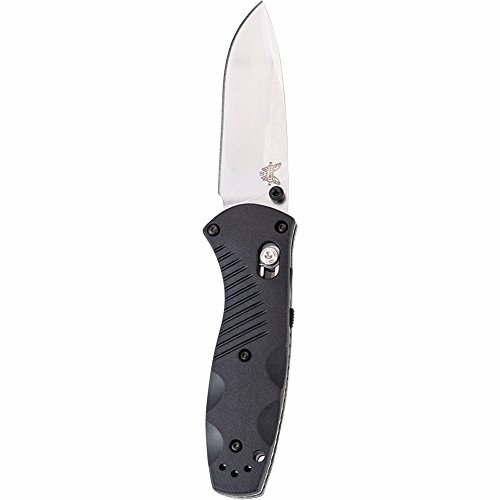 If your knife needs repair or sharpening, Benchmade will take care of it. Available for knives purchased from an authorized dealer.